This book took the author thirteen years to write. 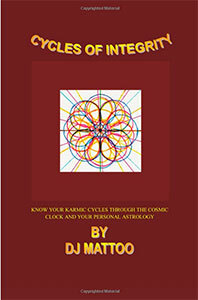 After thirty-four years of research, reading and living the cycles of "The Cosmic Clock" which is our karmic clock. A clock that tells us the time and nature of our returning karma, compounded with our known astrological configurations, "The Cycles of Seven", and the cycles of "The Ten Perfections of the Buddha", the author has discovered that every event in our life is due to synchronicity, that everything happens in a pattern, from before we are conceived and throughout our entire life. Like us, Our Earth has gone through many endings and beginnings. The law and cycles of the universe are built on mercy and love for every erg of energy that is life, for that life must return to its creator, for every erg of energy belongs to its creator. It is for the love of that life that the law of eternality is, for life must return to itself and death is but a door. If you do not believe in the importance of each individual, just think of how many works of music are created from just eight notes, how many different fingerprints exist from a few lines and circles, how many billions of stars there are in the heavens, how many individuals there are on earth, how many cells there are in our bodies, how many atoms that make up those cells, how much of life we do not comprehend, the possibilities are endless and so is life itself. If we are all fulfilling our true individual purpose harmoniously the universe would resonate as one astounding symphony. The initiations we encounter at each cycle is part and parcel with the negative we must balance along with our four elements, spiritual, mental, emotional and physical; our four lower bodies through which our soul is experiencing this journey back to our Creator, gathering reams of gossamer luster, creating that luscious pearl of wisdom from every grain of karmic sand until attaining the wisdom of the mind of "The Christ" and "The Buddha" otherwise known as "Enlightenment". To convey the message of the messengers' message of God to man. How our Father/Mother God long to welcome us home. All the prodigal sons and daughters that have gone astray and wondered so far away from home. Come home my children come home. You have suffered long enough it is time for you to come home. Wondering far in the playgrounds of earth, with scraped elbows and bruised knees, as you have lowered your energy to that of lesser gods, chasing after painted rainbows and false promises. Gave up your wings but still wanting to fly with bought and stolen highs, Falling off cliffs of illusion to bottomless pits of desire. It is getting dark the sun is going down it is time to come inside to your family of light where you belong. To sup at the table of your Father and Mother, of healing herbs and elixir of light, it is time to come home my children of light. Come in from the darkness of Terra's night. This book also includes, Ascending with your Cosmic Clock, Twin Flames and soul mates, The Fourteen stations of the Piscean and Aquarian Cross, The Fall of Man, the exposure of the "Lie" the divide and conquer tactic s, Sacred Sexuality, why relationships end, what is wrong with our education, the cause of substance addiction, The truth about each zodiac sign, where to find your missing elements. why children behave he way the do, why we have the parents and family environment we do. how to understand our subconscious blocks, why events happen when they do. How to understand your past life karma. How to gain mastery over these negative blocks. We must accept this gift of the science of "The Cosmic Clock"/ our karmic clock, given to us by the Divine Mother, and the gift of the opportunity to transmute our negative karma into the golden light of illumination, given to us by Saint Germain, the hierarch of the Aquarian Age, to change our past, make good use of our present and pave a clear path for our future for each one of us individually and for our beloved planet earth.